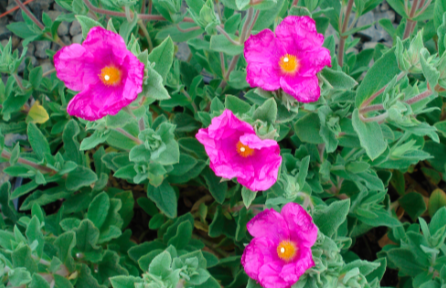 Compact low growing Rockrose with spectacular hot magenta flowers from May to July and sporadically after that. The large flowers (3″) cover the handsome felted light green foliage. To 2′ x 3′ in 6 years. Full sun and poor to average well drained soil. Light to little summer water. Hardier to cold and more compact if you avoid rich soil. Tough little evergreen plant. Protected locations like a hot south facing hillside are ideal.